Mrs. Chow's Kitchen » You Want Pies With That? Posted by Madam Chow Published in filo, spinach, You Want Pies With That? Ah, yes, what can it be? For, you see, this month’s theme is Masquerade Pie, chosen by Mary at Alpineberry and Jeanette at Jeanette’s Mommy Musings. Well, here you go. What’s green and white and encased in golden filo? What is masquerading behind that plain exterior? I had my eye on this recipe for quite some time. 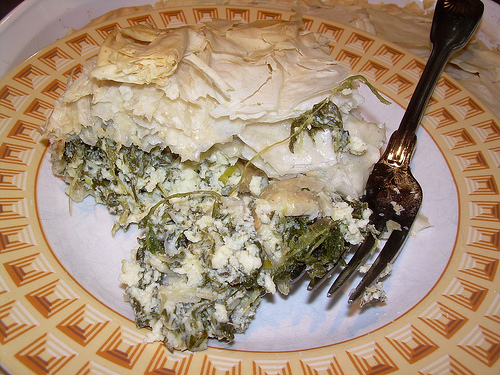 I’m a fan of cookbook author Beth Hensperger, and this Filo Green Tart with Fresh Dill and Feta is from her wonderful book, The Gourmet Potluck: Show-Stopping Recipes for the Buffet Table . This pie was fantastic. 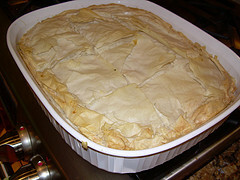 The texture was great: a rich filling topped with the crispy, buttery filo. And it was sooo flavorful. I used low fat cream cheese, cottage cheese, and feta, and cut back on the butter and olive oil. I loaded up on the herbs and added a squirt of lemon juice. Even my husband, who is not a big fan of feta, loved this. Definitely on the repeat list. Be sure to check out You Want Pies with That in the next week for the monthly roundup of Masquerade Pies! Recipe after the jump. 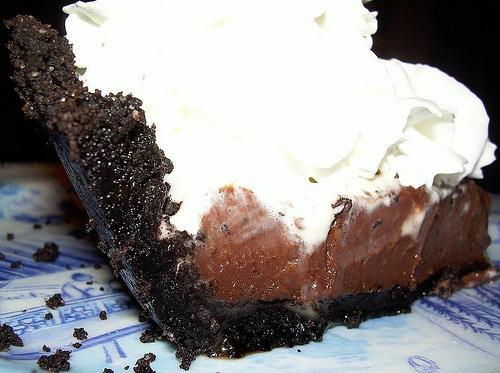 continue reading "Masquerade Pie for “You Want Pie With That?”"
Chocolate Cream Pie for July’s “You Want Pies with That?” and to Kick off a Week of Chocolate! Posted by Madam Chow Published in chocolate, pie, You Want Pies With That? Starting today, I’m going to post a chocolate recipe a day for the next five days. I have a serious chocolate craving and, by golly, I aim to satisfy it. I am not a chocaholic (I’d choose a citrus dessert over a chocolate one in a restaurant), but once in a great while, I get chocolate brain. This month for You Want Pies with That?, Rebecca at Ezra Pound Cake and Mary at Alpineberry chose “Taste of Summer” as the theme. For me, summer means fruit, berries to be precise. But I’ve made so many berry pies that a desire to do something different, combined with an intense craving for chocolate, resulted in this marvel of deliciousness, Ye Olde Chocolate Cream Pie. I’d never made it before, and I’m glad my recent chocolate jag led me to take the plunge. (Wow, whipped cream is hard to photograph). Some friends of ours recently had a second child, and mom was out of town for the weekend, so we invited dad, the babies, and his visiting mom over for dinner. The pie was a hit, especially with their 19-month old daughter, who is not a big eater. Apparently, they had yet to try chocolate cream pie because after one bite of it, she pointed to it repeatedly, loudly proclaiming “PIE!” every time she wanted her dad to shovel some more into her mouth. Her sweet, chocolate-covered mouth. I love cooking. Moments like that make it all worthwhile. 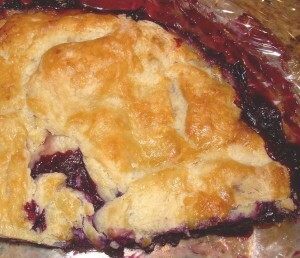 You can find the recipe after the jump, and check out the blogroll after July 7 to see what other pies everyone baked. 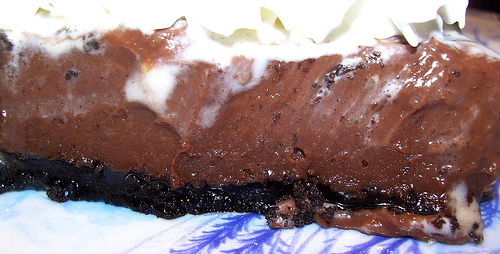 continue reading "Chocolate Cream Pie for July’s “You Want Pies with That?” and to Kick off a Week of Chocolate!" 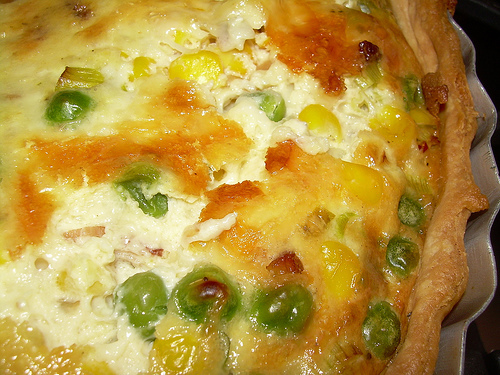 Posted by Madam Chow Published in quiche, vegetable, You Want Pies With That? This month, for “You Want Pies with That?”, Ellen at Kittymama chose “Childhood Memory Pies” as our theme. With spring in the air and summer just around the corner, what came to mind was the one summer when I was losing my front baby teeth. Why? Fresh corn on the cob. One of the finest foods on earth. Summer = corn. What I remember is sitting out in the backyard, gnawing away at a corn cob in my toothless state. I would not be deterred. Pain was brushed aside as I gummed those ears of corn for all I was worth. Ah, the memories! 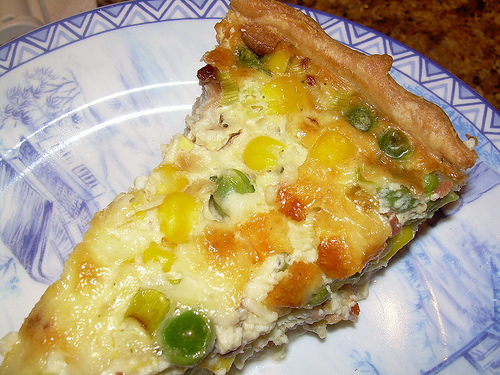 So, when I saw a recipe for roasted corn quiche in King Arthur Flour Whole Grain Baking: Delicious Recipes Using Nutritious Whole Grains , I knew I had to make something like it. I used my variation of Dorie’s Good for Almost Anything Pie Dough (left out the sugar in the crust), and filled the pan with roasted corn, peas, green onions, onion, a bit of leftover bacon, some thyme, Worcestershire sauce, Tabasco, salt and pepper, and a bit of left over habanero cheddar that was languishing in the refrigerator. Into the oven it went (I used a 10-inch diameter pan, about 1-3/4 inches deep) and emerged 45 minutes later. Served with a tossed green salad, it was a satisfying dinner. And it will tide me over until I can get my hands on some good local corn later this summer. To see the other pies that the Pies with That gang baked this month, check out the blogroll – a roundup will be up soon after June 7. Posted by Madam Chow Published in blueberry, You Want Pies With That? This month, “You Want Pies with That?” bakers were asked by Natalie of Oven Love to create a pie based on a “Family Favorite” dessert. Oh, dear. This was tough. Why? Because my mom rarely made the same dessert twice. I was the primary cookie baker, and I went through a phase where I made chocolate pudding on a regular basis. But I wouldn’t call those “family favorites.” We had ONE family favorite, and that was flan. And I like flan plain – I did not like the thought of putting it in a crust. 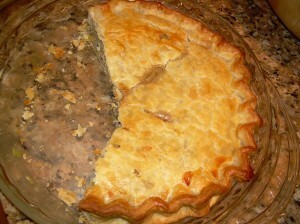 The only other thing that my mom made on a regular basis (when we had a peach tree) was peach pie and peach ice cream. The peaches in the store are pretty bad right now. So I made one of my current family favorites: blueberry pie. I used scraps of leftover dough to make the lattice, and that’s why it looks so awful, but I’m not about to waste good, butter-laden pastry crust. The Pies with That gang has baked some gorgeous pies this month – go check them out! continue reading "You Want Pie with That? 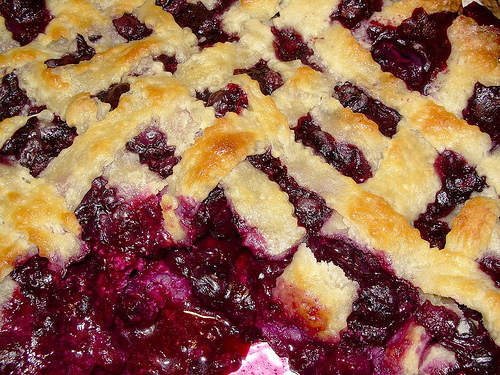 Family Favorite Blueberry Pie"
Posted by Madam Chow Published in crostata, lemons, ricotta, vegetable, You Want Pies With That? There are times in life when I really, really wish that people like The Equalizer, or the folks on Leverage existed in this world, and that they were on my side. Or that I could conjure up Machiavelli, ply him with food and wine, and get some sound advice on how to deal with nasty people. Sometimes, I feel like I was raised amongst Hobbits in The Shire. I need a cunning mastermind to help me navigate some of the perils of society. Hey! I can do that! This month, Jacque and Natashya asked us to make a special pie based on someone famous. 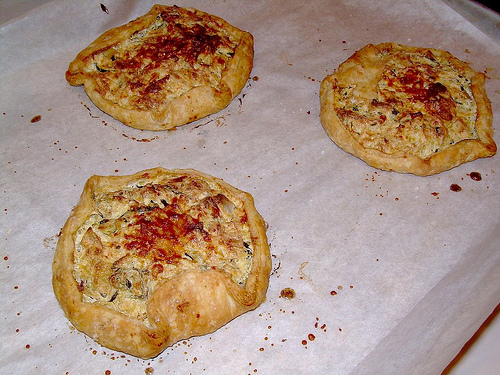 So, in keeping with my savory theme of late, I decided to invite Niccolo over for dinner, and serve him a zucchini, lemon, and ricotta crostata. Because he’s Italian, I thought the flavor combo would appeal to him. I found inspiration from this recipe in the October 2008 issue of Bon Appetit. It needed a bit of jazzing up, and I was happy to oblige. I didn’t use Dorie’s pie crust (which I use for everything, including savory pies — I just omit the salt) because I like to practice with other dough recipes every now and then. 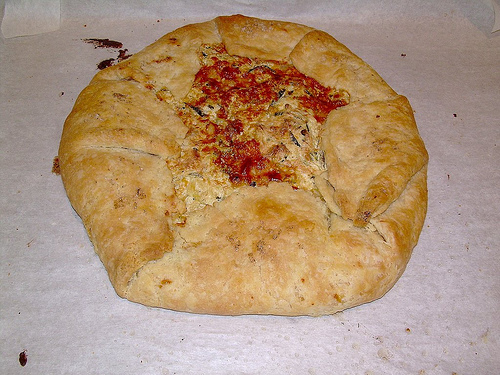 This was a good crust, but I still prefer Dorie’s. The recipe can be found after the jump, but check out the Pies with That blogroll to see who others invited to dinner! And I posted three times yesterday (making up for lost time), so scroll back and see what I’ve been up to. continue reading "Where Is Machiavelli When You Need Him Pie? 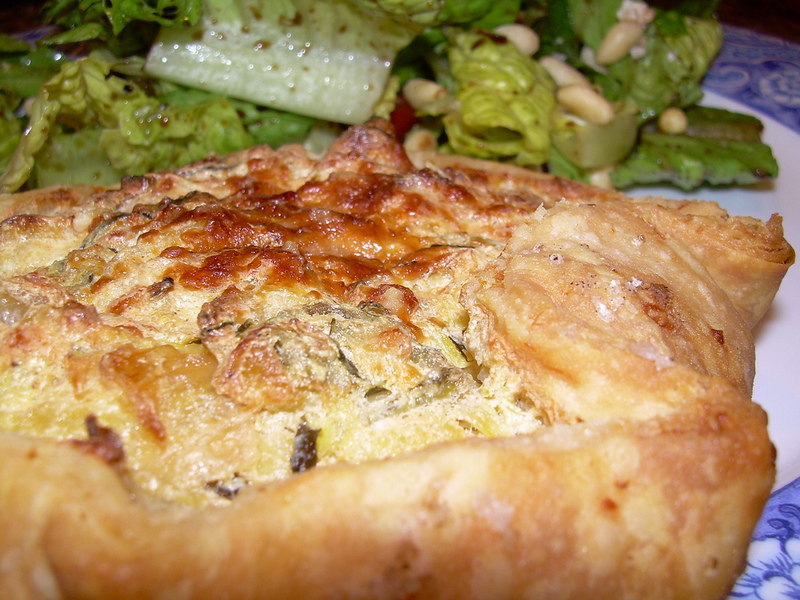 Zucchini, Ricotta, and Lemon Crostata"
Posted by Madam Chow Published in quiche, You Want Pies With That? 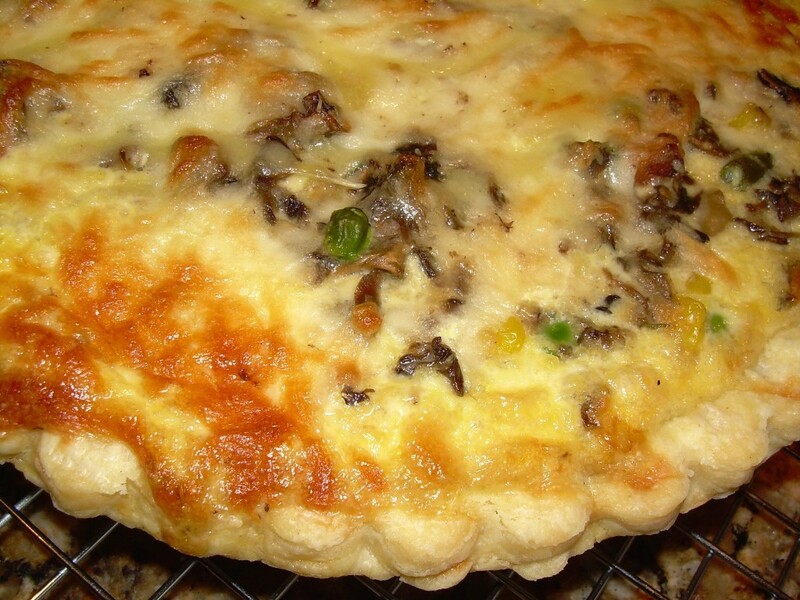 I’m going savory on you again with this month’s “You Want Pie with That?” theme of herbs and spices – I made a quiche for the first time in about twenty years! Thanks to Elizabeth of Cake or Death for choosing the theme. I was inspired by a Tastespotting post I saw several months ago from a blog called “No Thyme to Cook.” It appears that the blog is now gone, but I was able to find her recipe by looking through cached records on Google. I tweaked it to work with what I had on hand, and it was delicious! This recipe includes nutmeg, pepper, thyme, Tabasco (made from a Tabasco chili pepper) and mustard, for a total of five herbs and spices! Woo-hoo! Something I’ll be making again and again to use up leftovers. To see what the other pie bakers were inspired to make, be sure to check out the Pies with That blogroll. 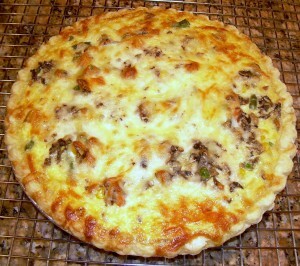 Recipe after the jump . . . .
continue reading "You Want Pies with That? Herbs & Spices on Pi Day (March 14 – 3.14!)" 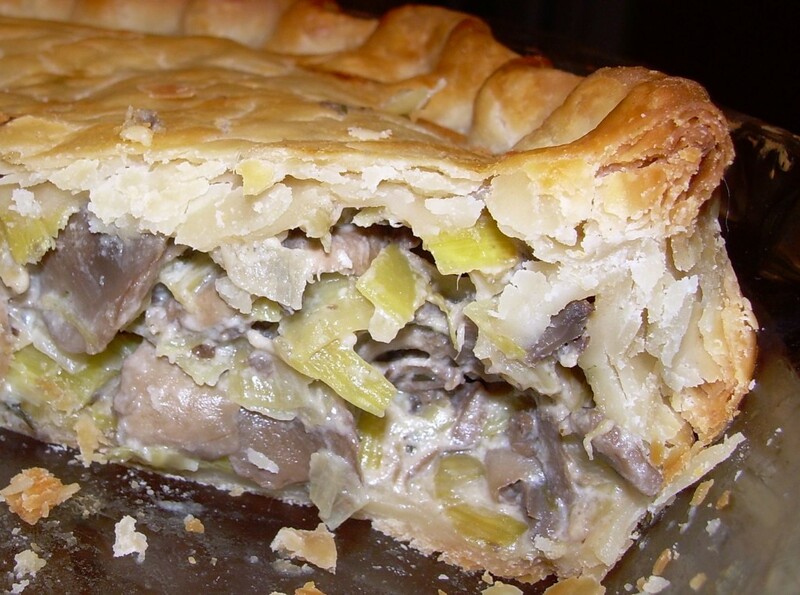 For this pie, I adapted Dorie Greenspan’s Good for Anything Pie Crust recipe, and mixed together a wonderful combo of leeks, mushrooms, thyme, and Boursin cheese. Oh, and a bit of Dijon mustard. 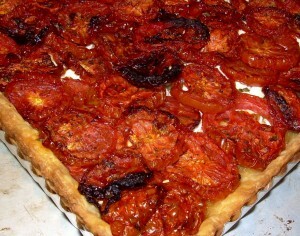 The result is a savory tart with a lot of substance that has become very popular with my family and guests. 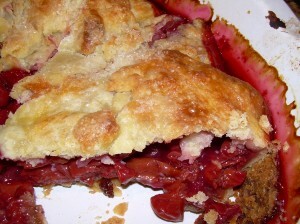 Recipe after the jump . . . .
continue reading "A Literary Pie for “You Want Pies With That?” Inspired by the Bard Himself"
Posted by Madam Chow Published in cherry, crostata, You Want Pies With That? Now, under normal circumstances, for me that might be a fudge and nut filled ice cream pie. But these are not normal circumstances. I’m so burned out on chocolate, cream, and chocolate cream yule logs, that nothing tempted me. I had to think long and hard, but I came up with one thing: a sour cherry pie. In heaven, I will have sour cherry pie on a regular basis, I assure you. I love fruit pies, and this has to be one of my favorites. I bought the cherries at our farmers’ market last summer, pitted them (hours, people, hours of work), then froze them. To make the pie (or crostata), I thawed eight cups of frozen cherries overnight, then I mixed the drained fruit with 1/4 cup of tapioca FLOUR (not the pearls), 1 Tbsp. of all purpose flour, about 1 cup of sugar, and 1/2 tsp. of almond extract. I tucked the mixture into my adaptation of Dorie Greenspan’s Good for Anything Pie Crust, substituting cream cheese for the shortening. I brushed the crust with an egg wash, sprinkled on some sugar, and baked the whole thing for about one hour at 400 F, until the top was golden brown and the juices were bubbling. The whole thing fit into a deep dish, 10-inch pie plate. If the crust starts to get a bit too dark, before the juices bubble, just cover the whole pie with a sheet of foil. What can I say? Yum. Resolutions broken, you dastardly pie bakers. Be sure to check the You Want Pies With That? website in a couple days to see what great pies other pie aficionados came up with. 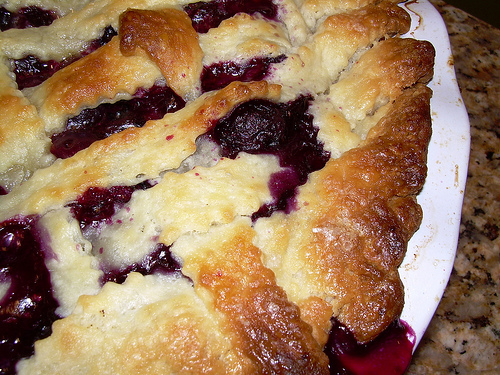 Concord Grape Pie – You Want Pies With That? This month’s theme for “You Want Pies with That?” is pies as a fashion statement. And my statement is “Purple Passion.” Pardon the really bad photos, but the good news is that we ate this so quickly that I had no pie to go back and re-shoot. It was gone! Eaten! Vanished! One of my favorite colors is purple, and according to the fashionistas, that color is “in” again this season. So, when I saw concord grapes at the store, and realized that I’d been wanting to make a concord grape pie for several years, I carted home a few pounds of these lovelies and got to work. Now, a few words of warning. First, do not make this pie for guests. Why? Each grape has to be seeded, and you are bound to miss a few, which will not be a pleasant experience for diners. Second, YOU WILL HAVE TO SEED EACH SLIMY LITTLE BUGGER. It took me about 2.5 hours to seed four pounds of concord grapes, and the texture of the grape makes this hard to do. Third, the juice stains. Given the amount of work involved, despite the pie being absolutely delicious, I do not anticipate making it again, unless bribed. Once again, I used an adaptation of Dorie Greenspan’s Good for Anything Pie Crust, and substituted cream cheese for the shortening. I tweaked a Concord Grape Pie recipe in David Lebovitz’s fantastic book, Room For Dessert : 110 Recipes for Cakes, Custards, Souffles, Tarts, Pies, Cobblers, Sorbets, Sherbets, Ice Creams, Cookies, Candies, and Cordials. If you’ve ever had Welch’s grape juice or jam, that’s what the pie tasted like but not as sugary sweet and with considerably more depth of flavor. I was surprised by that, because I thought it might have needed some lemon zest, but the pie was perfect just as it was. 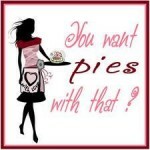 To see who else baked a pie fashion statement, be sure to stop by the YWPWT blog and click on the blogroll. 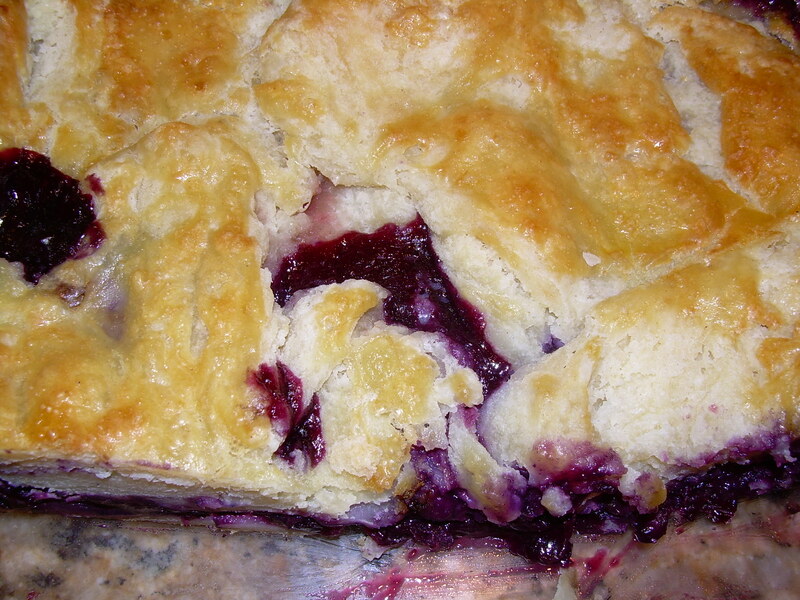 Recipe after the jump . . . .
continue reading "Concord Grape Pie – You Want Pies With That?"